YEREVAN (Sputnik) - The ruling Republican Party of Armenia (RPA) has decided not to put forward its candidate for the position of prime minister, following consultations with Acting Prime Minister Karen Karapetyan and former President Serzh Sargsyan, Vice President of the Armenian parliament Eduard Sharmazanov said Saturday. "Today at the meeting of the RPA faction members with party chairman Serzh Sargsyan and first deputy chair Karapetyan, the decision was made to avoid putting forward a candidate for the position of prime minister," Sharmazanov said. The vice speaker of the parliament added that the goal of the move was to avoid conflict. "This decision was made because the RPA's position is to strengthen the state. This was a unanimous decision, we all agreed that this was the right decision for the moment," Sharmazanov said. Earlier this week, Sharmazanov, who is an RPA member himself, said the party would meet to choose its candidate by Monday. The local opposition intends to continues protests despite the ruling party's decision to abstain from fielding a candidate, the spokesman for Civil Contract party, Tigran Avinyan, told Sputnik on Saturday. "We will not change our plans, we will continue protests. Sharmazanov's statement is not enough. The RPA should show clear support for the candidate chosen by the people," Avinyan said. 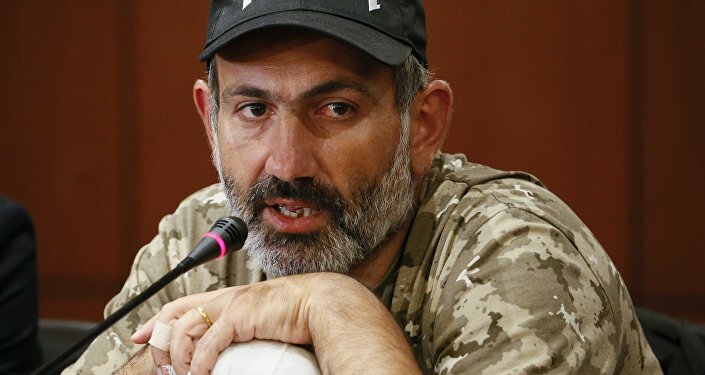 The head of the party and Armenian opposition leader Nikol Pashinyan said earlier in the day that he was not against the idea of blocking the railway network, suggested by some protesters. "We met the delegation members from the city of Alaverdi, who said that they wanted to block the railways. If they want to, let them do this," Pashinyan said at a rally in the city of Vanadzor. The opposition leader added that the protests would resume across the country on Sunday. "All of this is being done so that the parliament chooses the people's candidate as prime minister," Pashinyan, whose candidature the opposition has been proposing, said. The country's parliament will debate the choice of the prime minister on Wednesday. In early April, Armenia saw a wave of protests over the nomination of Sargsyan for the position of the prime minister. On Monday, he resigned, with Karapetyan assuming the position. The key opposition figure, Nikol Pashinyan on April 27 vowed that the country's opposition would boycott a suggested by Karapetyan snap parliamentary election if he wasn't chosen the opposition's prime minister. Prior to that, Karapetyan refused to engage in talks with the protest leader, explaining that they had no prospects.